PORT MORESBY, Nov. 16 (Xinhua) -- Chinese President Xi Jinping and Papua New Guinea (PNG) Prime Minister Peter O'Neill pledged to further enhance bilateral cooperation while attending the opening ceremony of a PNG and China friendship school here on Friday. The Butuka Academy, a public service project funded by China, consists of a kindergarten, a primary school and a secondary school for over 3,000 students. While addressing the cheering crowds, Xi said China and PNG have witnessed closer people-to-people, cultural and educational exchanges in recent years, as well as vigorous development of cooperation among local governments. 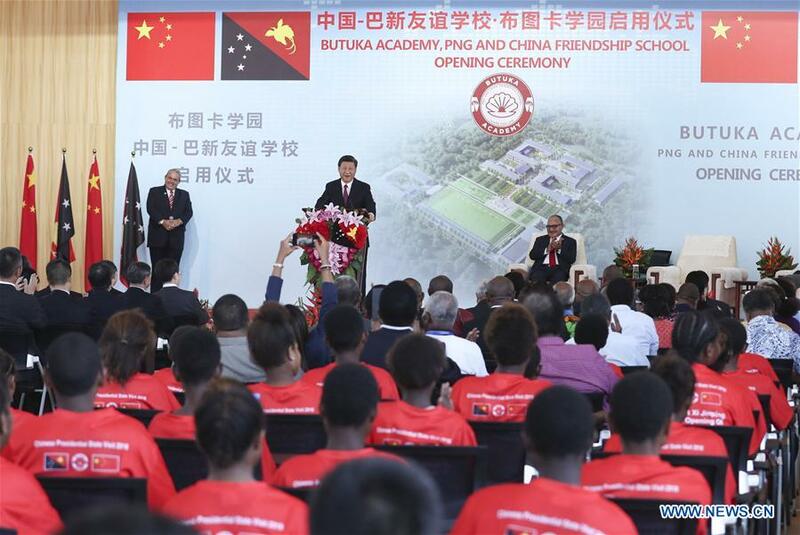 The Butuka Academy is the fruit of friendly cooperation between the PNG capital and China's Guangdong province and Shenzhen city, Xi said. Noting that talents are the primary resources, the Chinese president said teaching one to fish is better than giving him a fish. China funded the academy's construction with the aim of helping PNG nurture talents who Xi believes will strongly support PNG in sustainable development and catching up with other countries. Xi said China is willing to work with PNG to deepen the profound friendship of the two peoples and cement the foundation for future development of bilateral ties. The friendship has been passed on from generation to generation, which is the most important basis of bilateral relations, Xi stressed. He said he hopes the two countries' youths will learn from each other, deepen mutual understanding and faithfully carry forward the China-PNG friendship. For his part, O'Neill said the academy is another example of the strong relationship between PNG and China. The prime minister thanked China for its long-term support for his country, saying China's assistance has not only boosted PNG's economic and social development, but also helped elevate the PNG people's living standard. He also thanked China for its assistance in building the Butuka Academy and in offering opportunities for PNG youths to study in China. The prime minister said he believes that the PNG-China comprehensive strategic partnership will continue to grow deeper and further promote PNG's economic and social development. While touring the academy, Xi and O'Neill interacted with Chinese table tennis coaches who were training local athletes, and encouraged them to be friendly messager between the two peoples. Xi arrived here Thursday to pay a state visit to PNG and attend the Asia-Pacific Economic Cooperation Economic Leaders' Meeting.